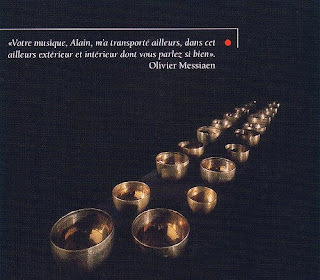 'A brilliant student, encouraged by Stravinsky, Boulanger, Milhaud and Messiaen, Alain Kremski abandoned the more obvious musical route to pursue the mystical universe of temple bells, gongs and bowls. He won the Prix de Rome for composition and was in residence for three years at the Villa Médicis where he established a firm friendship with Balthus, built on a shared passion for painting, sculpture, literature and travel... His compositions do not seek to evoke the sacred music of the Far East and its ritualistic codes, but find their place in the context of contemporary music where East and West coincide. Kremski would, modestly, consider them as an homage to Tibetan civilization and the its precious spirituality which Western culture must preserve at all costs' - source Cezame music agency. 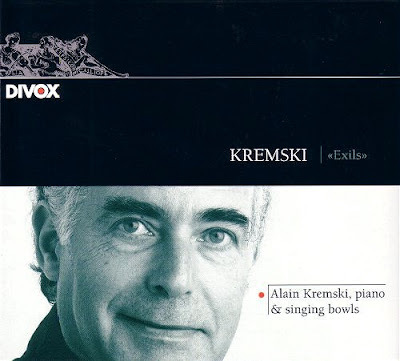 Alain Kremski's unique music has featured here before and in Exils (Exiles), which is dedicated to the Dalai Lama, Tibetan singing bowls are scored as equal partners with a piano to produce a soundworld of strange sounding intervals and harmonies. Although Exils does not imitate ritual music it subordinates Western priorities of melody and rhythm to pure sound-values. In line with Balthus' philosophy expressed below, it is better to listen to this ineffable music than analyse it. But an exploration of the dedications of the work's five movements provides a fascinating insight into the strange voyage of this brilliant musician. 1. "Prière": Tibetan temple in the mountains - dedicated to Balthus. An iconoclastic artist who believed paintings should be seen and not analysed, Balthus refused to provide any biographical information. When asked for a biography for a Tate retrospective in 1968 he famously replied by telegram: "No biographical details. Begin: Balthus is a painter of whom nothing is known. Now let us look at the pictures. Regards. B." 2. "Souvenir": Lullaby for a Tibetan child - dedicated to Olivier Messiaen. Alain Kremski studied with Messiaen and the sleeve for Exils, seen below, carries the following quote from his teacher, "Your music, Alain, has transported me to other places, to the external and internal worlds which you evoke so well". 3. "Exils": Meditation on space, time and memory - dedicated to Kalou Rinpoche. A Buddhist monk and teacher, Kalou Rinpoche was one of the first Tibetan masters to teach in the West and founded the Kagyu Rintchen Tcheu Ling temple in Montpelier, France - where, coincidentally, I will be in a few weeks. 4. "Aube": Christ alone on the Mount of Olives - dedicated to Lama Guendune Rimpoche. A Tibetan meditation master, Lama Guendune Rinpoche spent more than thirty years in solitary retreat in Tibet and India. 5. "Contemplation": Secret prayer on the holy name of our Lord Jesus Christ - dedicated to Jeanne and Josée Salzmann. The teachings of the mystic G.I. Gurdjieff continued after his death under the guidance of Jeanne Salzmann. The screenplay for Peter Brook's film of Gurdjieff's Meetings with Remarkable Men was written by the director and Jeanne Salzmann, and Alain Kremski collaborated on the soundtrack. Alain Kremski has recorded ten volumes of the Hartmann/Gurdjieff compositions. Can Olivier Messiaen, Peter Brook and Alain Kremski, not to mention Saint Gregory, Bach, Mahler, George Harrison, Jonathan Harvey and Tom Service all be wrong? * An extended range audio system is required to achieve the full impact of the Tibetan singing bowls on Exils - this is certainly not one for PC speakers or iPpod earbuds. An MP3 download is available, but the higher resolution CD is recommended because this is a recording where the sound really matters. thank you, bob! looks fascinating. I do like Hamza Yusuf. schuon's also got a lovely book, 'treasures of buddhism,' that you might like.